A rather somber subject today but I like the photo. 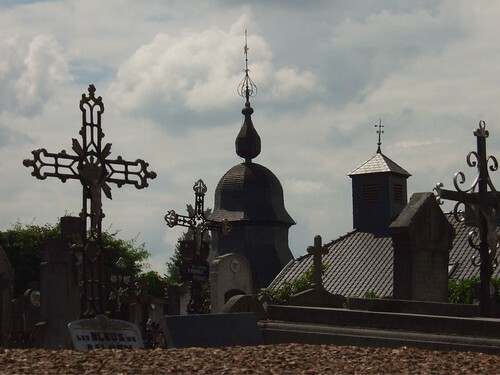 It's a view of the cemetery of St Pancrace in Dalhem, a town in the Province of Liège. In the background you see the towers of the vielle ville, the old town. there are so many things to look at in this photo. it's singing a little gray song of sorrow. What a fabulous old cemetery! I have a small collection of crosses so am particularly drawn to all of them here. Beautiful! this is very beautiful! it looks like a very fancy skyline.